So Marcus is the Core Data guy, but I’ve been working with it a good bit myself lately and was recently faced with having to add re-ordering for a list of entities in a UITableView. The methods I found online for accomplishing this all suggested using an NSMutableArray as the data source for the table view. That will work, but I came up with another method, though similar, that achieved what I need without having to switch from using my NSFetchedResultsController as the data source behind the UITableView. In the end, I did use an NSMutableArray, however, I end up using it just to take advantage of its indexing. Read on to see what I mean. 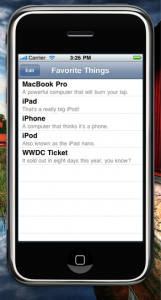 Download the source code for the Favorite Things project. This post is about re-ordering so here is the point. NSFetchedResultsController doesn’t have a built in way to re-order the results, so load them into an NSMutableArray, rearrange them there, and then re-iterate over the items once sorted setting each of their displayOrder field as you go. Then save the managed object context and you’re all re-ordered. // Grab the item we're moving. // Remove the object we're moving from the array. // Now re-insert it at the destination. // object's displayOrder field by iterating through the array. You may be thinking that if you iterate through every object in your results you’re actually loading them into memory. This is true, but not something to be concerned about for a couple reasons. First, the results were loaded into memory to display in the table view already. Also, in any table view where you are planning to re-order your results, it is highly unlikely that your list of objects will be very long as trying to re-order too many objects would just prove frustrating for your user and your design has just clearly demonstrated the need to be re-designed at that point anyhow. There are just a few more points I want to make before we’re done. The project template I used is just the default navigation template along with Core Data for storage. The NSFetchedResulsController in tandem with a simple NSMutableArray works great to provide re-ordering for your table views. Until next time. This is great—if only you’d written it a few weeks ago! I went through a lot of trouble trying to sort a list alphabetically by a ‘name’ attribute, but with with numbers last, like in the iPhone contacts app. Eventually did settle on adding a sortOrder attribute to my model, but it made me feel dirty (makes sense here, of course). Good to know that having a sortOrder attribute is basically just How It’s Done. good post. My preference is to lazily create the fetch request and the sort descriptors. Then when the list needs to be resorted, I will set the fetch request, sort descriptor, and then the fetchedResultsController to nil. The getter for the sortDescriptor then is setup depending on which ever property needs to be sorted. Then when the tableView or specific rows are reloaded the fetchedResultsController is reinitialized and the different sortDescriptor can be used. Thanks Matt! I think I found a bug, however. If you re-order more than one item and then re-start the app, you’ll see that the ordering was not persisted correctly. This seems to be caused by -tableView:moveRowAtIndexPath:toIndexPath: assuming that the array of entities returned by [fetchedResultsController fetchedObjects] is always sorted correctly–it isn’t. Anyways, thanks to you and Marcus for providing such an amazing resource for everyone else–keep up the good work! Thanks, Clint. I’ll take a closer look when I get a chance. I can see what you’re saying. It seems your solution is fine, but there may be a better way. Will see what I can find. The Apple docs mention that NSFetchedResultsController is designed to respond to changes at the model level. E.g. you change the model, save it and then the view automatically updates. However when you re-order something using the tableview methods the view is already correct (because you’ve dragged and dropped the cell there) and so when the delegate detects your index changes, it walks all over your view believing the cells to be in their original position. The trick is to ‘disable’ the UI updates with a boolean in your delegate methods. Set the boolean just before your re-indexing and unset it afterwards. I just needed to do this and was pondering a good way to do it. Thanks for this and the other articles I’ve read over the last few months! 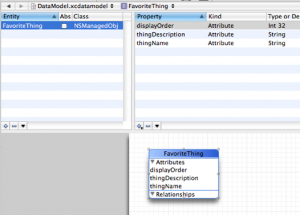 I have a single entity model with some 6 attributes in it. I have used table view to list all the datas and implemented the delegate protocols to respond to changes. 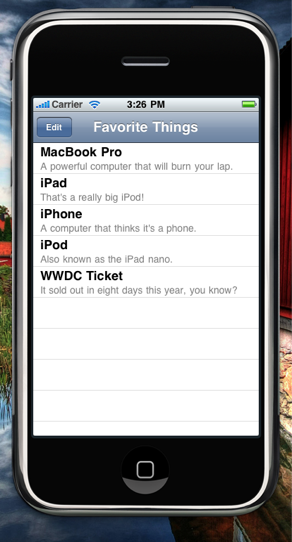 I feel like I have implemented all the stuffs as it should be but the app gets stuck while deleting a row. While the app still is functional with the code the navigation around the ui element becomes impossible. The application gets stuck at the place where the animation for the deletion of the row has just started and gets hung with the delete button and the deleting row still showing.